Andy Murray’s Wimbledon prospects look a whole lot brighter after a confident first-round win over lucky loser Alexander Bublik. 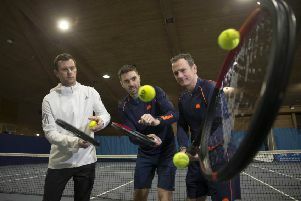 The build-up to the defence of Murray’s title had been dominated by concerns over a hip injury and the world number one’s poor form in 2017. But the Murray who lost so woefully to Jordan Thompson in the opening round at Queen’s Club three weeks ago was nowhere to be seen. The Scot continued to limp between points, as he had since resuming practice on Friday, but movement was just one of the things he did well in a 6-1 6-4 6-2 victory. All that held up Murray were two brief rain delays, but he did not allow his momentum to be disrupted and eased to victory in an hour and 44 minutes, setting up a second-round clash with German-Jamaican Dustin Brown. Brown, like Bublik, plays in an unorthodox style. With pregnant wife Kim and the Duchess of Cambridge among the spectators, Murray was welcomed onto Centre Court with a roar as he fulfilled the defending champion’s duty of opening the tournament. Bublik, a 20-year-old rap fan from St Petersburg with plenty of swagger, walked on court wearing large white headphones and immediately showed he was not overawed by the occasion. Murray had to save two break points in the opening game but, once he had done that, the first set was virtually flawless. The Scot was hitting the ball crisply, finding the lines and anticipating everything Bublik could throw at him. The 20-year-old is known for his love of drop shots and ‘tweeners’ but Murray is the master of mixing things up and raced through the opening set in just 29 minutes. Murray has struggled for form during a season disrupted at regular intervals by illness and injury. But nothing brings out the best in the 30-year-old like the lawns of the All England Club and his relaxed attitude in practice despite the discomfort hinted that he was feeling good about his game again. Murray’s service speed was down but his forehand, so wayward at times this season, was sharp and secure and his backhand equally strong. A few errors began to creep into his game as Bublik fought to stay in contention in the second set, and the Russian-turned-Kazakh had his chance at 0-40 with Murray serving for the set. But the Scot saved all three and then finished a rally Bublik had been in total control of with a forehand pass whipped past his stricken opponent. Bublik could only shake his head and applaud, and a netted forehand on the next point gave Murray a two-set lead. Two double faults from Bublik - his overall tally was 12 - gave Murray another break just before the rain arrived. With it forecast to clear quickly, the roof was not deployed, and Murray was in a hurry on the resumption, swiftly reeling off the four games he needed for a thoroughly satisfactory day’s work.